"This publication was developed by Aitkin County Public Health, Healthy Northland, and the Minnesota Statewide Health Improvement Partnership (SHIP), and is published by the Minnesota Institute for Sustainable Agriculture." Schools, childcare centers, hospitals, non-profits, corporate cafeterias, and anyone else who serves food to the public: if you want to start sourcing local food from farmers in your area, but you aren’t sure how to do it, this new Toolkit for Direct Purchasing of Local Food is for you. 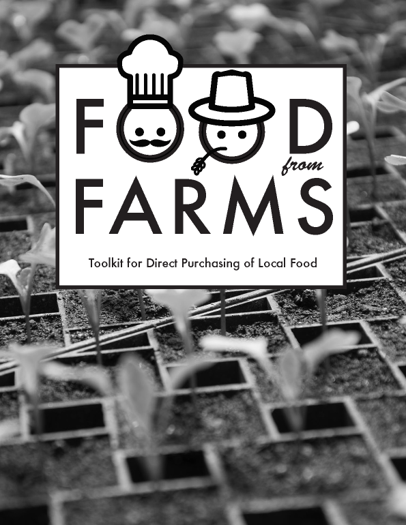 The toolkit offers examples and templates for starting up community-based procurement of local food directly from farmers. It was originally developed for use by a small school district in northern Minnesota, and was designed for compliance with United State Department of Agriculture – Food and Nutrition Service (USDA-FNS) guidelines for informal procurement by Child and Adult Nutrition Programs (CNPs). The toolkit is quite adaptable to other situations, though: versions of it have been used for local food procurement by a hospital and a non-profit organization. The Toolkit enables an organization to craft a transparent process that involves administrators and community members, makes sales opportunities available to the widest variety of local farmers possible, complies with applicable state and federal laws, and builds community support. While the stepwise process and many templates provide a nearly turnkey package, adaptation of the material is highly encouraged. Communities and organizations can take ownership of this process and mold it into a system that works well for their particular situation. The original development of this Direct Purchasing Toolkit and the associated protocols and materials was sponsored by Aitkin County Public Health, Healthy Northland, and Minnesota’s Statewide Health Improvement Partnership (SHIP). Compilation of the toolkit was sponsored by Minnesota Institute for Sustainable Agriculture (MISA). Valuable insight and feedback came from the Minnesota Farm to School Leadership Team. Staff members from the Minnesota Department of Education provided information and assisted with development and review of this document. This document is not an official publication of the Minnesota Department of Education.